Porsche 718 Boxster Performance, Engine, Ride, Handling | What Car? 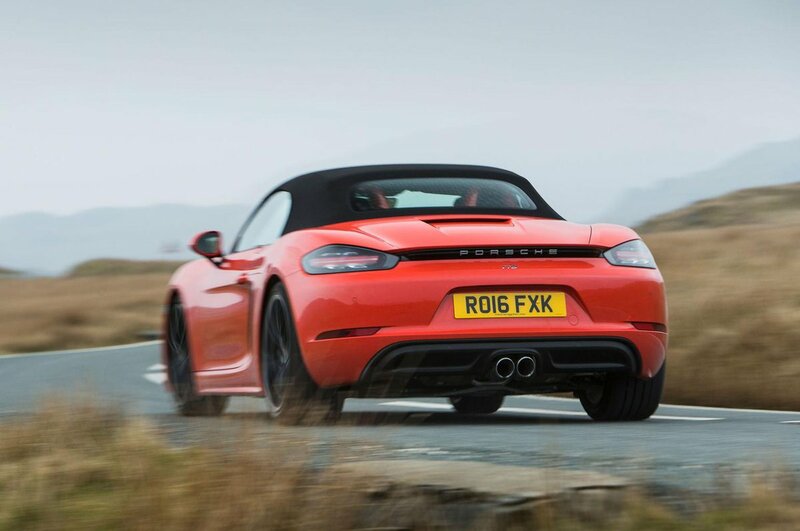 Choosing an engine for your 718 Boxster is a relatively simple affair; you can have an entry-level 2.0-litre unit with 295bhp or a larger 2.5-litre that produces 345bhp in the S or 360bhp in the range-topping GTS. The 2.0 is our favourite because it pulls well from low revs but still gives you a real kick in the back as the turbo kicks in at around 2000rpm. Unfortunately, there’s slightly uneven power delivery for the next 1000rpm or so (and this is even more obvious in the S model), but once you get the revs above 3000rpm, there’s hugely potent acceleration right through to 7000rpm and above. Unsurprisingly, with only 15bhp more than the S, the GTS version delivers a very similar level of performance. However, the key difference between the two is that the latter has a far smoother power delivery, thanks to a revised turbocharger. In Sport driving mode, the engine is wonderfully responsive from low revs and immensely flexible in the mid-range, exhibiting fewer flat spots. And despite the fact that the engine still sounds somewhat industrial, the larger air intake at least generates a more tuneful sound. All of this is good news, of course, because not only does the extra torque of the GTS help mitigate the effects of the Boxster’s overly long gearing, it also gives you more opportunity to exploit one of the most biddable chassis on sale today. A six-speed manual gearbox is standard. A seven-speed dual-clutch automatic 'box is optional and worth considering for those expecting to do a lot of daily slogging through traffic. We’ve only tried the Boxster with optional Porsche Active Suspension Management (PASM) adaptive dampers and 20mm lowered sports suspension; in this form, it rides remarkably well by sports car standards. Sure, it's firm, but the damping is good enough to keep you from ever feeling uncomfortable. Only constant road imperfections really expose the stiffness of the chassis and, even then, we’d still say it offers a great balance of comfort and precision. However, the GTS model is arguably even more remarkable. Despite coming with even firmer suspension, it manages to be just as comfortable and exhibit even better levels of body control than the standard car. As long as you slacken the adjustable dampers via a button on the centre console, the car can cover ground at a rate that would trouble a 911 Carrera, such is the suspension’s ability to soak up battered bitumen. It’s a truly remarkable feat, especially when you consider that the GTS comes equipped with hefty 20in wheels. Not adding the lowered suspension to the standard Boxster and sticking with smaller wheels will undoubtedly bring a softer ride that might suit those expecting to tackle fairly rough roads regularly, but we'll need to try the other suspension options to know for sure. 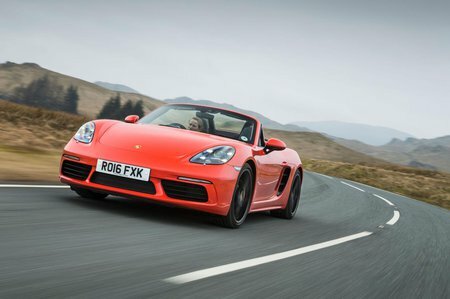 Any sports car worth its salt needs to offer handling excitement in spades and the Boxster certainly doesn’t disappoint. Its steering is wonderfully accurate and precise, with enough feedback to give the driver plenty of confidence. Turn in to a bend and there’s virtually no body roll and an enormous amount of sideways grip. Put simply, the Boxster's handling is on a different level to its rivals, including the BMW Z4, Jaguar F-Type and even the Audi TT Roadster. The Boxster also has a wonderfully broad range of talents. It feels just as at home on fast sweeping corners as it does pottering around town, where the steering is light enough to make parking easy. Although it has a fabric roof instead of the more durable folding metal hard top of rivals, such as the Z4 and Mercedes-Benz SLC, the Boxster is very well insulated. Keep the roof up (it can be raised or lowered at up to 31mph) and the car tackles the elements with aplomb and filters out most wind and road noise. Lower the roof and the Boxster will keep those inside relatively sheltered from the wind, helped by the standard net wind deflector. Many purists will miss the smooth wail of the six-cylinder engine that was fitted to the Boxster before it became the 718 Boxster, though. The four-cylinder engines don't sound special at all. Both gearboxes are close to perfect; the six-speed manual has one of the sweetest shift actions you’ll find on any car and the PDK auto is equally adept, if slightly less involving.